"And please, Mr. Spock, if you won't join me, don't disapprove of me. At least not until you've tried it, huh?" Early in the run of The Original Series, many episodes fit closely into the genre of mystery/sci-fi, pioneered by such shows as the Outer Limits and Twilight Zone. Often, the Enterprise visited planets that resembled Earth so that sets could be used that were already build to save costs. After receiving an "Earth-style" distress call, the Enterprise arrives at a planet that turns out to be, amazingly, a near exact copy of Earth. One would imagine that at this point in the series, not having yet encountered Earth duplicates with strange twists to history, they would be surprised at such an "astonishing" discovery. Perhaps Gene Roddenberry thought they would not have to make use of such a device in the future. Beaming down to the planet are Kirk, Spock, McCoy, Yeoman Rand and two red shirts. They find that some disaster has occurred in the planet's history. Suddenly they encounter a crazed, distorted person who attacks McCoy as he handles a child tricycle laying in the rubble. Kirk is forced to punch the crazed man several times and then as they question him, a seizure occurs and he dies. McCoy's reading show that the man seemed to age a century in only a few minutes. Sudden noises propel the team to run about in an odd formation, searching for the source and they encounter a young girl, Miri (Kim Darby), who pleads with them not to hurt her. As with other shows that feature children as the central characters, this is one episode that I would usually pass on. This is not to say that it is bad or that others wouldn't like it... I just don't like shows that have kids as the central characters... sorry, Billy Mumy. This episode features two young guest stars at the peak of their careers: Kim Darby had a starring role opposite John Wayne in his Oscar®-winning performance in True Grit this same year, and Michael J. Pollard (Jahn), who made a memorable supporting appearance in Bonnie and Clyde in 1967. Each would go on to long careers in television and film, although not reach the heights of those two roles. Both give very solid performances in this episode and add to the quality of the show. They find they have been infected with a disease that had occurred when the planet's inhabitants had attempted to develop a formula for extending life. The resulting virus killed all the adults and extended the life of children. Miri turns out to be hundreds of years old; but, upon reaching puberty, as in the case of the previous attacker, the children sicken and die. As a young girl reaching puberty, Miri is attracted to the virile Kirk and he uses her puppy love to get information and, ultimately, attempt to contact the children, who have been living an endless existence without the benefit of parental supervision. The landing party finds that they cannot return to the ship without bringing the virus aboard (apparently the transporter bio-filters had not been dreamed up yet) and must desperately work against time to solve the riddle of the disease before they die from its effects. Spock: According to their life prolongation plan, what they thought they were accomplishing, a person would age only one month for every 100 years of real time. Rand: 100 years? And only one month? Rand appeared in only a few, but "memorable to many an adolescent boy" episodes in the first season, as Captain Kirk was forced to make do without a personal yeoman in the later part of the 5-year mission. Whitney later made several appearances on the big screen in movies featuring the original cast. Cast notes: Grace Lee Whitney had an un-credited role in Some Like it Hot as a band member. Ed McCready went on to play a number of bit parts in Star Trek episodes including an inmate in Dagger of the Mind, an SS Trooper in Patterns of Force and the barber in Spectre of the Gun. David Ross (credited as Security Guard #1 here in Miri) portrayed what became a recurring character, Lt. Galloway, with several appearances over the entire run of Star Trek. Jim Goodwin (Lt. John Farrell) had made two appearances previously in Mudd's Women and Enemy Within.) Kellie Flanagan (Blonde Girl) went on to portray Hope Lange's daughter Candice in The Ghost & Mrs. Muir. One of the kids is Steven McEveety, the director's son. John Megna (Little Boy, memorable for his "bonk bonk on the head" line) had previously appeared as Dill Harris in To Kill a Mockingbird and later portrayed the young Hyman Roth in scenes from The Godfather Part II that were excised from the original release and later restored in some subsequent releases of that film. Although not one of my favorite episodes, this is admittedly a pretty good one with interesting character interaction, good suspense and an intriguing if somewhat illogical premise. The Lord of the Flies homage and the performances of the guest stars add to the interest; so, I give this one three Enterprises. This episode begins with Kirk in the audience of a stage performance of MacBeth by a company of travelling players. His companion tells him to watch the actor portraying Macbeth, Anton Karidian (Arnold Moss), carefully and then claims that he is certain that this actor is Kodos the Executioner. It turns out that Kirk has diverted the Enterprise from its scheduled course, to confirm a report that this old friend, Dr. Thomas Leighton has discovered a new synthetic food. Actually, Leighton has filed a false report to bring Kirk to see the actor, who he believes was the infamous planetary Governor of Tarsus 4, responsible for ordering the deaths of 4,000 people—half of the planetary population—during a famine ostensibly to save the lives of the other half. Starfleet has closed the case, identifying a burned body of that of Kodos, but Leighton believes this to be false and that Kodos escaped alive. He begs Kirk, who like Leighton is one of the few alive who can identify Kodos, to help him expose the actor's identity. Although Kirk believes the report of Kodos' death, he does some research and finds the odd fact that no data is available on the actor Karidian prior to a time after Kodos' purported death. Kirk decides to meet the actor at a cocktail party that Leighton is giving at his house. At the party, Kirk meets Lenore Karidian (Barbara Anderson), who tells him that Karidian never meets his public. They have an instant attraction and Kirk takes her out on a walk to get to know her better. While walking they find the dead body of Leighton. This coincidence is unacceptable to Kirk and he determines that he must investigate the possibility that Karidian is Kodos and contrives to bring the company of actors aboard the Enterprise. Further research reveals that on the Enterprise is another eye-witness that can identify Kodos, Lt Kevin Riley. Kirk orders him transferred to engineering to keep him away from the actors, but refuses to explain his reasons to Spock. This troubles the First Officer, who decides to consult Dr. McCoy about the issue. There is a certain stiffness in Spock's behavior here that shows how the character of Spock had not yet completely coalesced in these early episodes. In fact, McCoy, while "having a drop," offers some to Spock, who refuses saying, "My father's race was spared the dubious benefits of alcohol." McCoy replies, "Oh. Now I know why they were conquered." Not the Vulcans we know now. 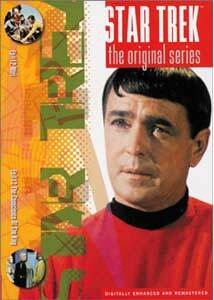 Spock embarks on his own investigation of the matter and finds the facts about Kodos, Riley and Kirk. This leads to a confrontation between Spock and Kirk over the First Officer's "interference" in his captain's affairs. An attack on Riley raises the stakes of the mystery and they begin to cooperate in determining the truth of the matter. Kirk confronts the issue directly and seeks out the actor in his quarters. This scene is one of the most well-acted in all of Star Trek. This episode is one of the most "artistic" of the series and demonstrates one of the ways Star Trek raised the bar on content for prime time television. Beside the bits of Shakespeare in the performance by the actors, there is the charged dialogue of Kirk and Lenore, filled with classical allusions and also a lovely sequence of Lt. Uhura (Nichelle Nichols) singing for Riley and playing a harp-like instrument that would later turn out to be a Vulcan instrument belonging to Spock. The conclusion is positively Hitchcockian. These atmospheric qualities and the performances make this a fine episode. The mystery is well-conceived and the story does not suffer from any lack of logic. Often Star Trek was referred to as "Wagon Train to the stars" when first developed to demonstrate how, even though the tale takes place in the distant future, the stories are about people in situations that "just happen to be" in the future. The plot here would be at home on almost any show, such as the discovery of a former nazi in a small town; taking place aboard a starship just gives it a special quality that is excellent future fiction. Cast Notes: Moss had a role as Don Nacio in 1952's Viva Zapata starring Marlon Brando. Anderson went on to portray Ironside sidekick, Eve Whitfield. Bruce Hyde had previously, and memorably, portrayed Lt. Kevin Riley in Naked Time where he seized control of the Enterprise. Just quoting Shakespeare is worth an Enterprise and I give this one a solid 4 Enterprises for a top to bottom high quality piece of entertainment. Image Transfer Review: The typically fine transfers on these discs give us an excellent visual experience of these episodes. People are the point in both shows on this disc, thus we get beautifully rendered colorful costumes, realistic skintones against details settings. The destruction of the Earth-like planet looks as realistic as 1960s television could render. The direction of The Conscience of the King, with eerie camera effects to heighten the mystery and the transfer looks particularly good in this one. Audio Transfer Review: The Dolby Digital 5.1 mix provides nice stereo separations on both of these episodes as each contains elements that lend themselves to ambient sound. The "phaser on overload" sequence in The Conscience of the King is particularly fine. The scenes in Miri where the children are toying with the landing party are also very good. Extras Review: The cover of this disc is one of those that don't properly reflect its contents with the head shot being James Doohan, even though Mr. Scott does not appear in either of these episodes. These head shots have seemed like very cheap design to me and though I have not particularly noted it on the many reviews I have done for this series, I don't like the covers and think they are singularly the worst part of the entire set. Fortunately, they don't matter that much. As far as extras, it is the same trailers and little booklet as usual. Another fine disc with appeal to both the casual science fiction fan and the Star Trek aficionado. Both episodes are excellent examples of the literate quality that often made it such a unique show, providing appealing storytelling beyond the space opera. The performances of the guest stars are high quality and the stories are interesting and unique. This one is a keeper for having two quality shows on one disc.